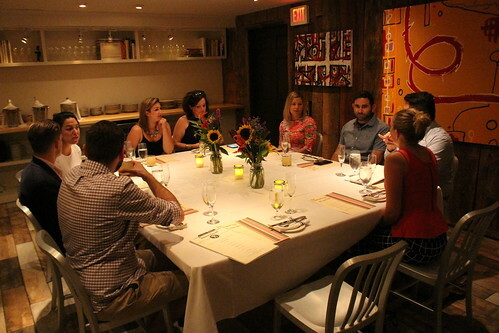 Urban Hearth is a small and charming supper club in North Cambridge, a short walk from Davis Square station. They're open for dinner and also for weekend brunch. I tried Urban Hearth recently and got a cozy corner table by the window. 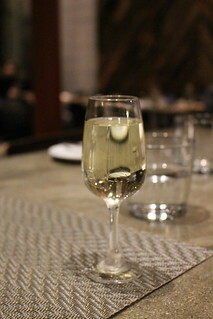 Urban Hearth offers a seasonal prix fixe menu for supper, with a three-course option for $70 or five courses for $85. We picked the three course option but ended up with a lot more food thanks to the extra appetizer, palate cleansers, etc. Even though the above pricing doesn't include wine pairing, they started us off with a cocktail made with blackberry syrup, pineapple and chamomile infused vodka, and lime. 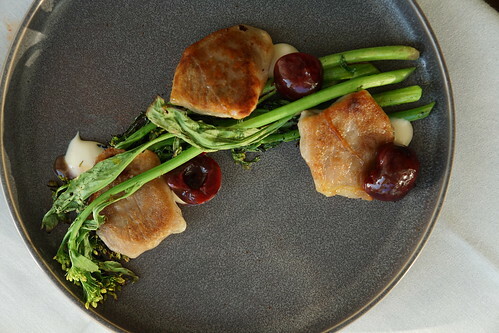 I admit, I had food envy, the lamb dumplings were great, especially paired with the cherries! The best meals are created when chefs get to play around and innovate with their ingredients. 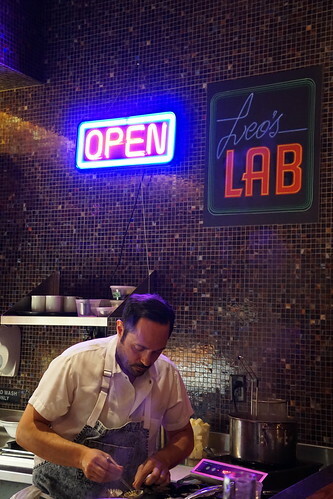 Chef Leo Asaro at Tico Restaurant in Boston's Back Bay gets to do every once in a while with a special dinner called Leo's Lab, which happen every 2-3 weeks. For Leo's Lab, guests are seated at the lab kitchen counter, so you can see all the action of Chef Leo Asaro preparing everything. There are only eight seats and only one seating for the night, so it's quite an exclusive experience. Each Leo's Lab dinner comes with five savory courses, a dessert, and a chef's special cocktail - plus a welcome glass of prosecco for $75. Instead of a server, chef Asaro serves and explains each dish to the guests. 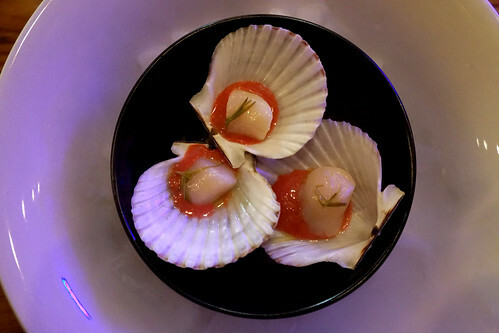 It was near the end of the season for Nantucket bay scallops, and we savored it paired with tart autumn berry sauce. The mole took chef Asaro 2-3 days to make and was very rich in flavors. The wrap filling was also accentuated with some rau ram (culantro). Waypoint is the seafood-focused restaurant from Chef Michael Scelfo from Alden & Harlow. Tucked between Central Square and Harvard Square, it has become one of my favorite restaurants to go to for seafood. 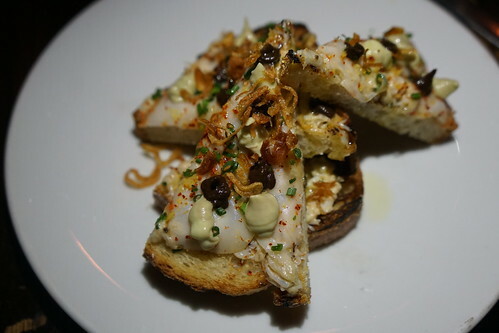 One time, I went for the chef's counter tasting menu using a Gilt City voucher (seriously, Boston's Gilt City has some great restaurant deals listed from time to time). We loved the wine. 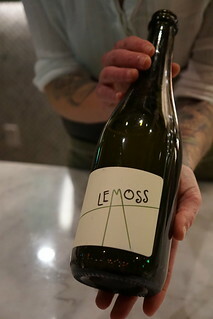 Le Moss is an unfiltered sparkling Glera Pet-nat (Petillant Naturel). Unlike champagne, these wines are bottled before fully completing its first fermentation. This was one of the better steak tartare in the city, in my opinion. The flavor and texture of the meat was spot on, and the slightly runny egg yolk added a nice touch. I have long wanted to try Toro. This tapas bar from duo Ken Oringer and Jamie Bissonnette has been around for many years (since 2005), but there's still always a long wait every night since they don't take reservations, even after they've opened other locations in New York and Bangkok. I finally went to try it when I saw a Gilt City voucher for it. The voucher for a tasting menu wasn't cheap at $100 but it was 8 courses including wine pairing, but the best part is that it allows you to make a reservation! If you've never used Gilt City, you can save $25 off your first order with my invite link. 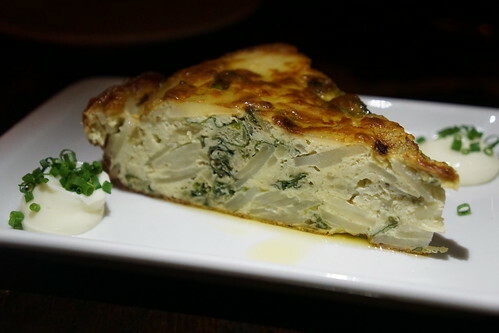 The tapas tasting started with a Tortilla Espanola (egg, onion, potato, nettle, aioli). A nice rendition of the traditional Spanish dish. The ratio between egg and potato is just right. 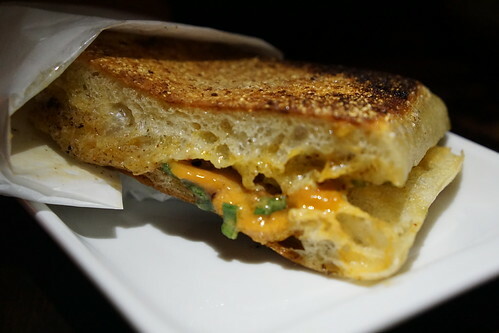 This is similar to the uni sandwich at Coppa. Of course, I'm always happy to get uni on a tasting menu. While this wasn't what I had in mind when I wanted a "pork" dish, I enjoyed the toast regardless. 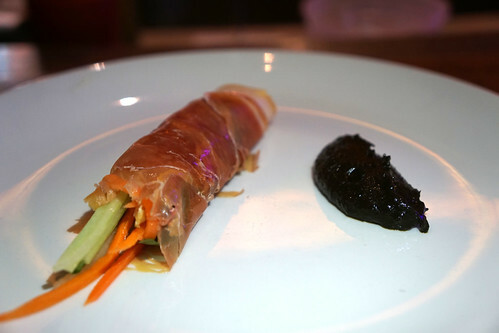 Journeyman is a small restaurant hidden in Somerville that only serves tasting menu. They're also one of the few (only?) spot in Boston that uses a ticketing system, and prices for the same menu vary depending on the time of your reservation. If you book a normal reservation, the 9-course tasting menu is $95. If you prepay by buying a ticket, the ticket is $85. 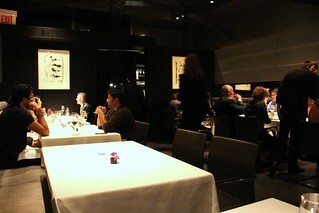 But if you want to dine at a non-peak time - say, a Wednesday at 9pm, it's cheaper still at $75. My friend and I wanted to go for cheaper still, and Journeyman also has a deal for diners who come on Wednesday, Thursday, or Sunday evenings after 8:30 pm. During this time, you can get a 4-course meal for $40! 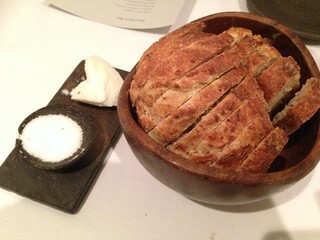 We sat at the counter and our meal started with a nice bread service. Since it's next to Backbar, they also have a daily milk punch menu. I'm partial to char ever since I went to Iceland and had a great arctic char at Blue Lagoon. I loved the crispy skin on this char. The flavors come together nicely in this dish and the chorizo oil added just the right amount of kick. I read recently that Clio, one of Ken Oringer's restaurants in the Eliot Hotel in Back Bay will be closing while Uni (also his restaurant) will be expanding into its space. I was a bit bummed by it since I recently tried Clio and enjoyed it. So, I thought I would blog about my experience there before they close, in case you guys would be enticed to go try it out! Plus, it's one of the only photos I took with my new Sony a6000 before it was stolen when my house got broken into the second time ... sigh. 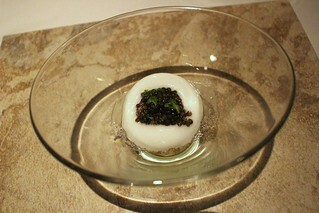 Dinner starts with an amuse bouche of nori with white umami cream cheese, lemon cream cheese - a rich umami bomb. 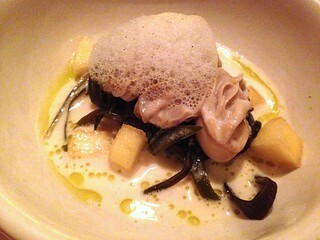 The soup is a local marrow squash with smoked salt foam. 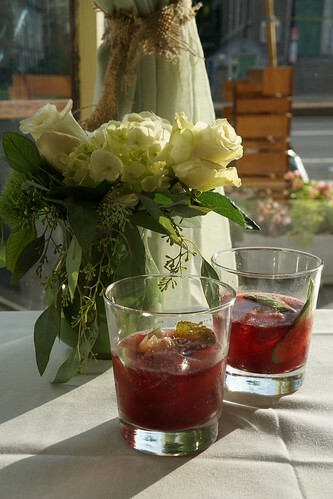 51 Lincoln in Newton will be opening their Tasting Room on July 29, where they will offer a 5-course prix fixe menu on Tuesdays-Saturdays. The Tasting Room will be located downstairs of 51 Lincoln.and can seat up to 20 people. Before dinner started, we got some cocktails from 51 Lincoln's bar menu. 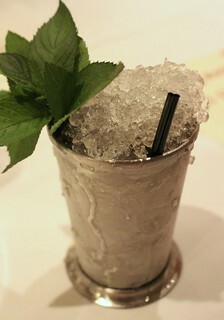 I had the Barkeep's Julep with bourbon, sarsaparilla reduction, Leopold fernet, and mint ($12). 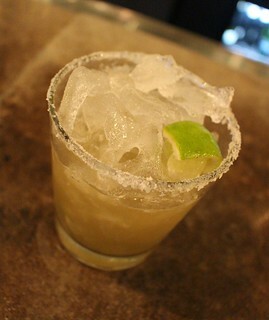 The fernet's bitterness added a nice depth to this classic cocktail. 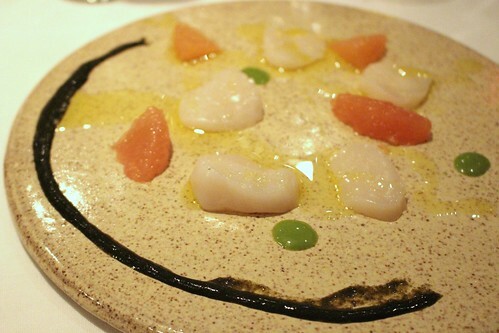 The first course of our dinner was a light, refreshing scallop crudo with grapefruit segments, evoo, opal basil sauce. 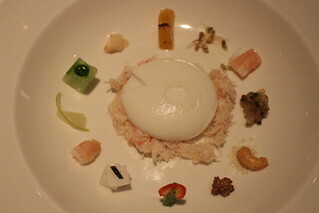 As you'll see throughout the dinner and in this course, the chef pays a lot of attention to the dishes and bowls used. 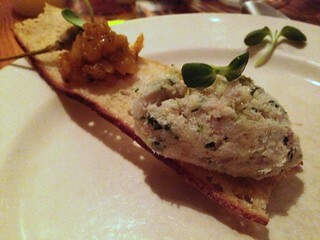 This was paired with a glass of Pinon sparkling Vouvray. 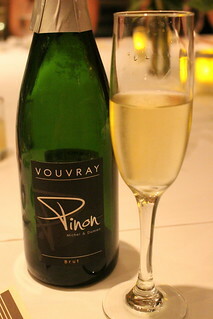 It's a creamier sparkling and it's a lovely pairing with scallops. 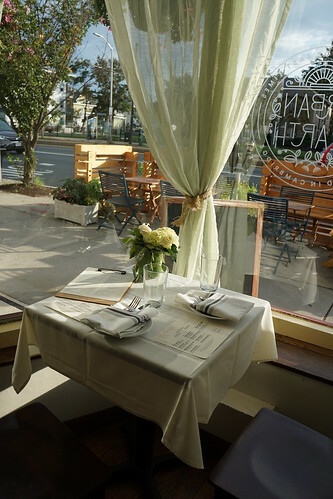 Chef Michael Cimarusti's Providence Restaurant celebrated its 10th anniversary with a four-course menu for $80 in June, but don't be mad that I didn't tell you because they've extended it to the month of July! Providence is one of the top fine dining destinations in LA, as evidenced by it having survived 10 years! It's one of my favorites, and though it would usually cost quite a pretty penny to dine there, every June they celebrate their anniversary with a cheaper 4-course menu (it has gone up from the $65 from a few years ago, but hey, inflation). And lucky you, they usually also extend it to July. Oh, and your $80 gets you more than just four courses. When I went there were amuse bouche upon amuse bouche and great bread service before the real dinner even started. 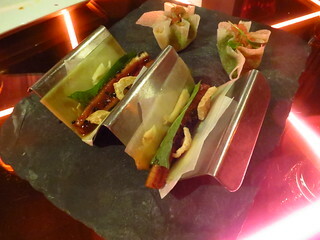 The amuse bouche included salmon skin chips with creme fraiche. 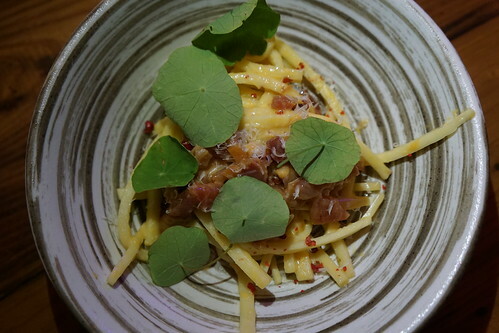 I never knew Salt Lake City to be a fine dining destination, but my last visit to Forage was an eye opener. Chef Bowman Brown's tasting menu at Forage is worthy to be compared to the best tasting menus in New York or other major metropolitan cities, and at a fraction of the price! 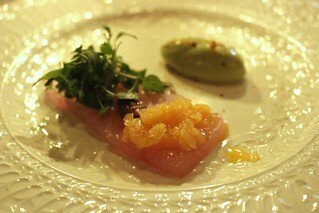 The food and presentation reminded me a bit of my experience at Willows Inn. 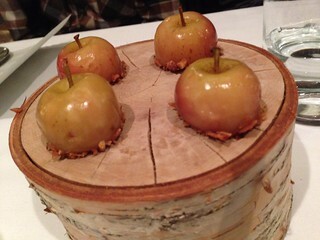 These tiny, bite-sized apples were filled with chestnut and coated in spruce vinegar. What a surprising dish and so fun to it. 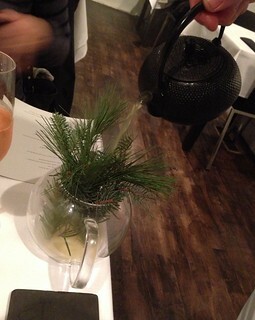 To make it even better, it was served with apple cider poured over spruce juniper. Can I have the whole pot? 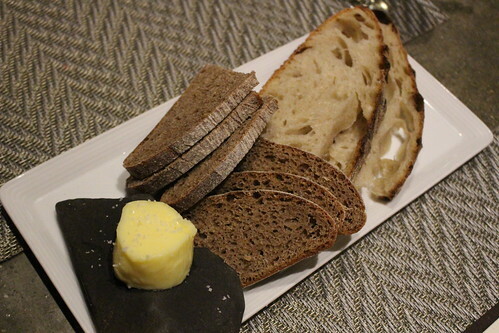 Bread with goat's milk butter, both really good (even if it doesn't compare to Willows Inn's chicken drippings to go with bread). 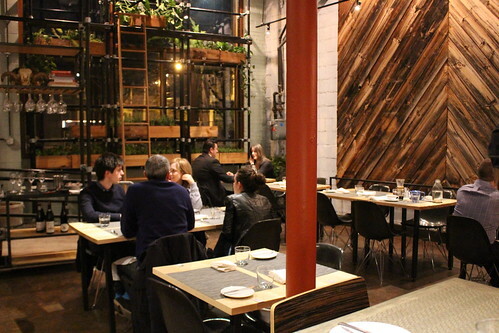 I finally tried Ten Tables in Cambridge, an outpost of the original in Jamaica Plain. It's a popular place - the cozy, dimly lit restaurant was completely packed and it wasn't even a weekend night. As with most other restaurants, they serve locally sourced ingredients, but instead of a hip, modern direction, they went with the comfortable, neighborhood feel. 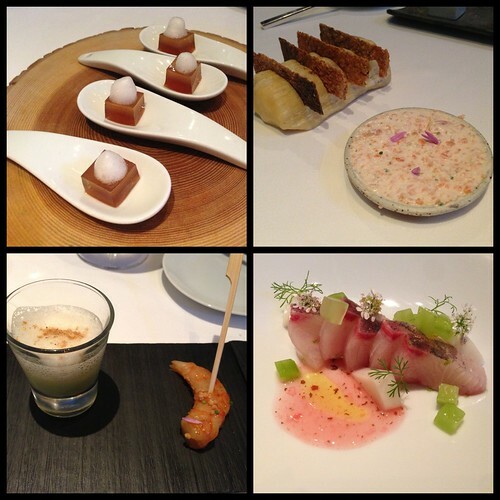 We went with the tasting menu instead of ordering a la carte, which is $55 for 4 courses. I liked this surprising dish. I don't normally associate oyster with a creamy broth and vanilla aroma, but after my initial suprise I really enjoyed how the flavors worked together. Trying to find all the best restaurants in Boston, I jumped at a Gilt City deal for a tasting menu at Ribelle in Brookline. 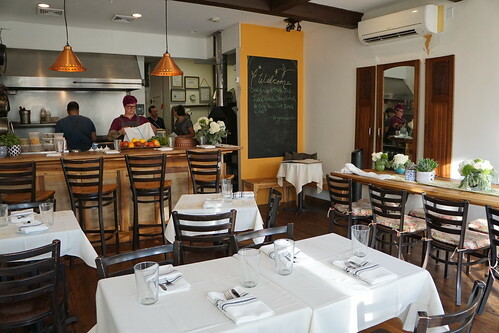 Ribelle is a small restaurant by chef Tim Maslow, a Momofuku alum. By the way, if you've never bought any voucher from Gilt City, you can get 25% off your first purchase using this link. 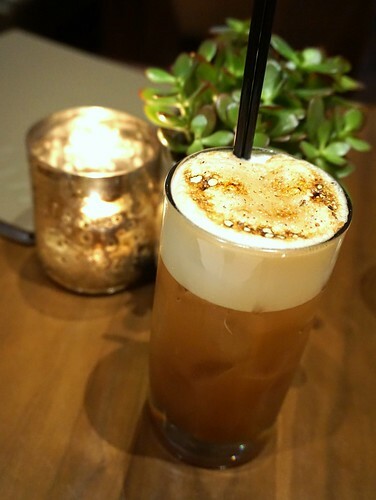 While waiting for my friends to arrive, I spent time at the bar with the Hip Replacement (Laphroaig, lime, salt, burnt cinnamon, $13), a nice cocktail with plenty of the components I like: smoke and citrus. 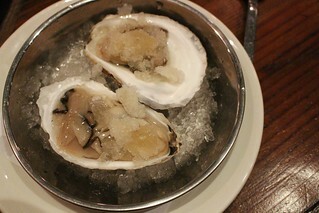 Our dinner started strong with some South Bay Blonde oysters with shiso ice. 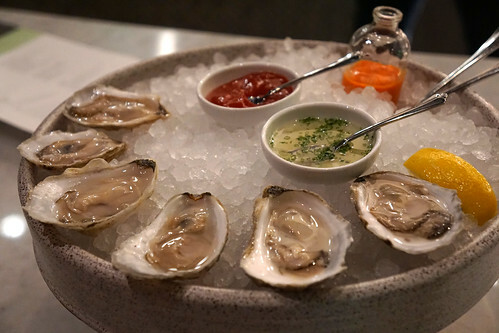 I'm really digging the briny East Coast oysters and these sweet oysters from Cape Cod are no exception. 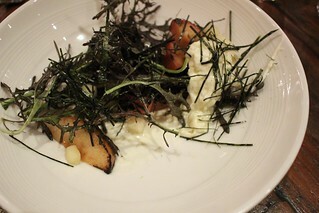 We had a wonderful salad of Macoun apples, stracciatella, mustard frill, nori. I can't think of a time I've had apples better and sweeter than these so I had to look them up. The macoun apple is a Fall fruit (yes, I'm behind on blogging and I had this meal in the fall) and is known to be especially sweet and juicy. 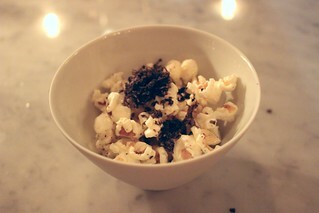 It really was sweet and paired so well with the creaminess of the stracciatella. I've been visiting one Grant Achatz restaurant/bar per visit to Chicago, starting with Alinea, then The Aviary, The Office, and now, finally, Next. As you may know, the menu at Next changes every few months, and we're not just talking seasonal changes but complete, absolute shift to distinct themes. 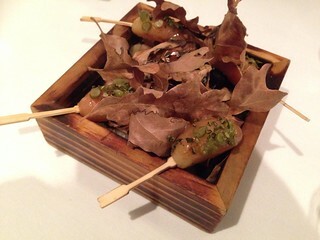 There had been Modern Chinese, Bocuse d'Or, Chicago Steak, and other themes. 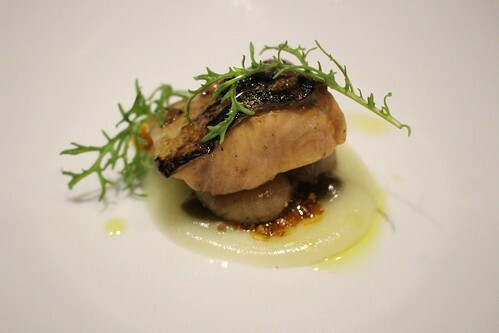 This time, since it is the 10th anniversary of Alinea, the theme is Trio. This is the restaurant in Evanston that Grant Achatz was working at when he met and subsequently partnered with Nick Kokonas to open Alinea. The menu thus evokes techniques and dishes that he served 10 years ago at Trio. This goes back to when they started playing with "neutral flavors" with the hardened sugar chip that adds texture to the dish. 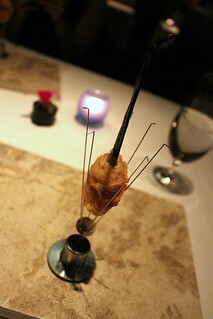 A simple fried shrimp skewered with a stick of vanilla bean to enhance the aromatic experience. When we were first seated, we were given a glass of rose. 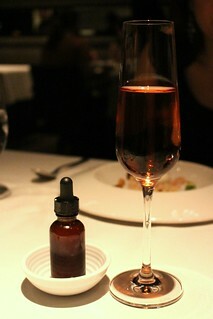 Now, they bring a bottle of housemade bitters that we can add to the rose based on our own taste preferences. When I had an overnight layover in Tokyo, I asked drtomostyle to take me to have kaiseki, the traditional multi-course Japanese dinner. 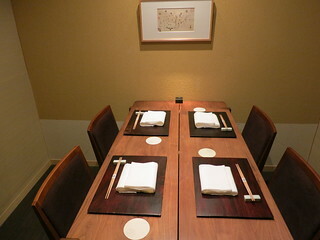 We headed to the 3 Michelin-starred Ishikawa in Kagurazaka, along with two of her friends. 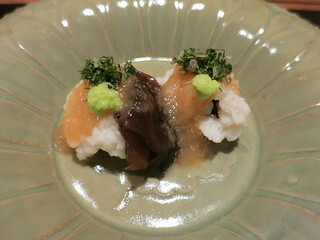 We started with a course of pike eel. 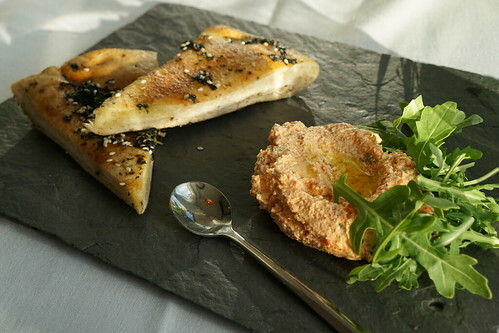 This was the last of the season of pike eel, which requires a lot of knife skills to prepare. 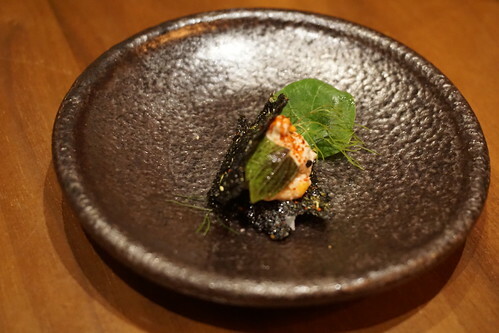 The delicate eel was served with a pickled plum sauce (a classic pairing for pike eel), shiso, wood ear mushroom, and wasabi. It's a wonderful start that really increases our anticipation. The next dish marks the transitions of the seasons. 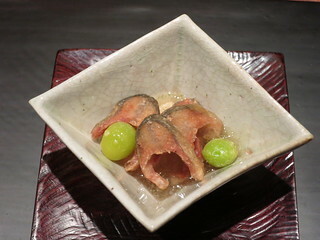 There are deep fried ayu (river fish) which at the time of the meal was at the end of its season. It was served with an ingredient just beginning its season: ginkgo. They're all served atop of daikon radish jelly. In other words, this was probably about the only time each year where you can have both ingredients together, and Ishikawa pairs them beautifully. When Maude opened, I asked the same question I ask about other celebrity chefs: "But can Curtis Stone cook?" I went the first time for the artichoke month and the answer was a resounding "Yes, Curtis Stone can cook, after all". 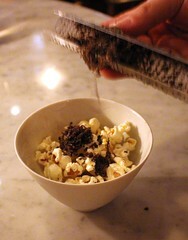 Before leaving for Boston, I went back for the morel menu. If you're not familiar with their concept: Maude serves only a prix fixe menu, which changes every month. Each month's menu is built around a particular ingredient: artichoke, rhubarb, morel mushroom, pea, and so on. The prices vary, since morel is obviously more expensive than peas. 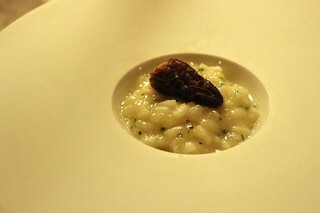 I wish I had a bigger bowl of this risotto, but I knew there are many more to come. The light zest of the citrus butter made each bite of the rich risotto feel fresh and new. 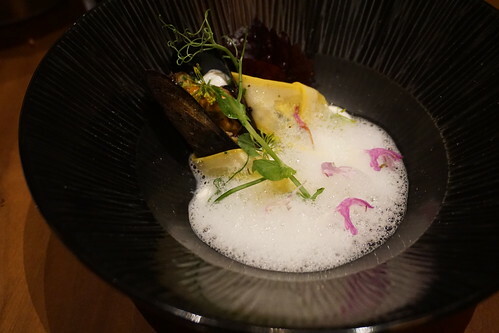 I was wondering how they would pair something as earthy as morel with a delicate kanpachi and passion fruit, but pickling it is ingenious decision. You may have read that The Bazaar at the SLS Hotel is celebrating their 5 year anniversary with a special $55 tasting menu until this Friday. Well, I couldn't find what this menu actually entails online, but I went there for dinner last night and thought I should share the menu with you! So, here it is. 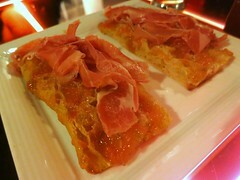 The $55 menu starts with pan con queso and pan con jamon, and three starters (chef's selection).